"When I did the eye seminar, at first my eyes got watery and felt a bit strained for a moment, but than I can see clearly straight away!" This intensive weekend certificate course may optionally get extended for health providers, to include additional 6 hours of post-course supervision, tutorials, and qualification exam, offering 20 CPD and an additional methodology that adds a new dimension to their practice. Graduates receive Diploma Certificates from Academy for Bioregulatory Medicine, accredited by the Institute for Complementary and Natural Medicine (ICNM), which make them eligible for membership of the British and International Societies for Bioregulatory Medicine (ISBM) and practice insurance, provided by Balens - a specialist for insuring health practitioners and organisations. 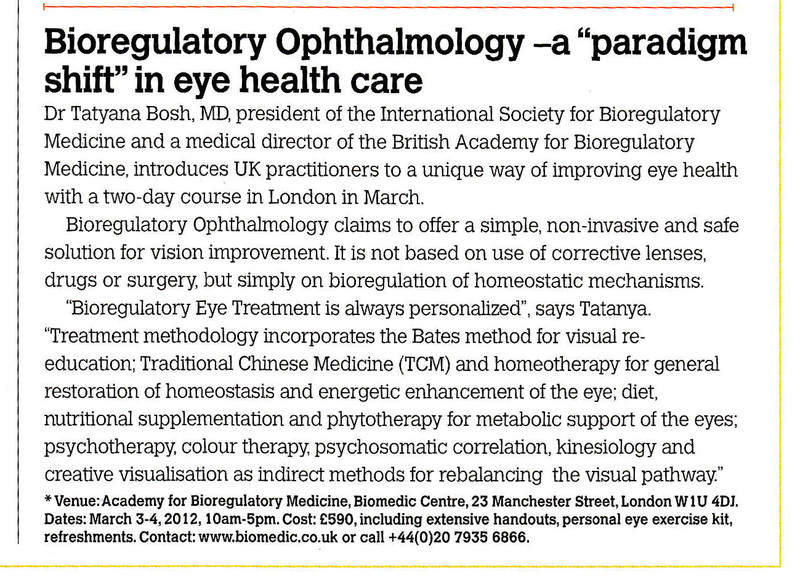 Additional Personal Biomedic Treatment:both fees include one hour of vision improving bioregulatory treatment by Dr Bosh, to be arranged after completion of the course.